Leverage your EHR to complete InterQual medical reviews automatically, instantly, and accurately. Conducting medical necessity reviews is a time-consuming manual process, which can take anywhere from 10-30 minutes for a typical review. Most of the clinical data needed is housed in the EHR, but requires a skilled case manager to extract it to populate the review. This inefficient process can consume your staff’s time, which could be better spent managing patient care. Today, advances in technology and adoption of industry standards are setting the stage to fundamentally transform utilization management from a predominantly manual, expensive and burdensome process to one that is automated, exception based, proactive and informed by clinical data. 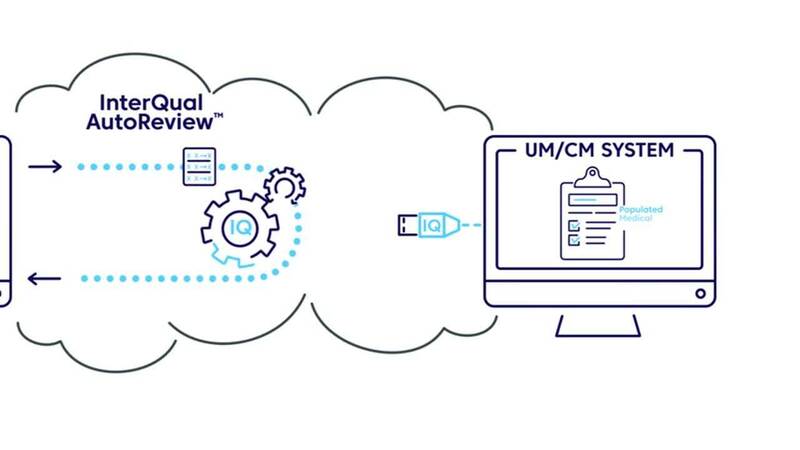 InterQual AutoReviewTM is a unique cloud-based solution that automates the InterQual® medical review using real-time data from your EHR. The first release, using InterQual Acute Adult Criteria (Initial Review and Episode Day 1), allows you to leverage clinical data in the ED—at the point of the admission decision.This breakthrough in automation helps simplify the administrative tasks of your UM staff, and allows them to focus their time on the exceptions that require their clinical expertise. In addition, it provides real-time decision support, potentially reducing inappropriate admissions and denials.